If you want to pay less than $15 for a Reiterate right now, you can’t. Copies began disappearing from the internet at the beginning of the weekend, and it may be surprising to some people what the catalyst was. Those of us at MTGPrice who are familiar with EDH figured it out. I have been about that EDHREC life for a while, and it’s been paying dividends. Ideally, we’d like to use these tools to predict these things before they happen, but the first step toward predicting future spikes is analyzing past spikes and finding out what occurred. In this case, someone decided that Reiterate was very good and decided to buy out the internet. The card is played in enough decks and is explosive enough in decks built around the new Izzet commander, Mizzix, that they felt a new price would stick. I don’t expect the $25 I see people trying to get to stick, but I bet the new price is around $10. The card was roughly $3 to $4 before, but I frequently got them shipped to me as “bulk” rares, so I expect copies to come out of the woodwork now and the supply will far outstrip a modest demand. Still, Reiterate is really good in Mizzix as well as Chandra and Jaya and Wort and the other commanders Douglas mentioned in his tweet. 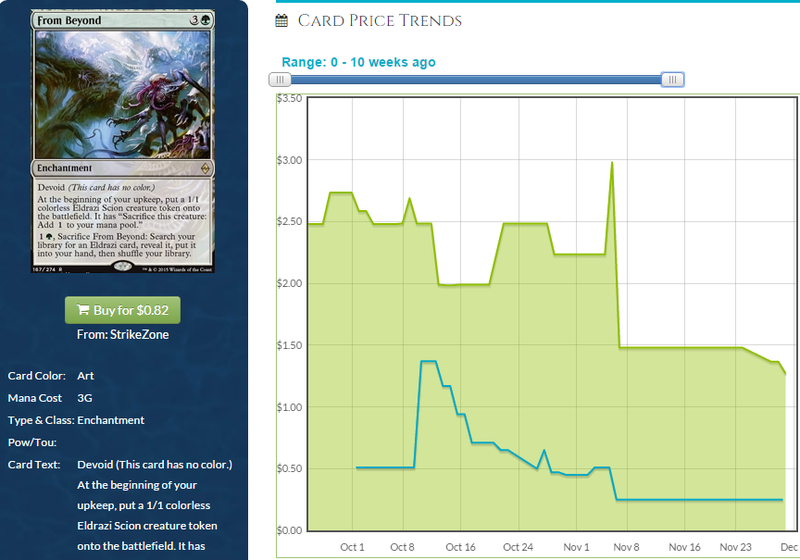 Most of those commanders aren’t new, so the only thing that is new here is the card has demonstrated how busted it is in Mizzix and someone has decided that we’ll pay five times as much for the card from now on. Maybe they’re right. After all, there are probably a lot of cards that are busted in the new decks. Reiterate has the distinction of being oldish (Time Spiral), not having reprints, having a keyword ability (buyback) that means it’s less reprintable than a card without such an ability, and did we mention it’s super busted in Mizzix? When you don’t have to pay colorless mana for it, it’s dumb and you can copy every spell you play. Who doesn’t want that? Can we pick out the next reiterate? We don’t all get the benefit of a buyout like we saw here, but we can have copies of similar good cards and be ready if a buyout does happen, or the inevitable march of progress pushes cards that are used frequently in decks that people are building this month up in value. Commander 2015 came out close enough to Christmas that I expect people to get these as presents, and the effect of the new generals to be spread out a bit so we have some time to get ready. Why not use the same website that we used to justify the reiterate spike to see what else is good? 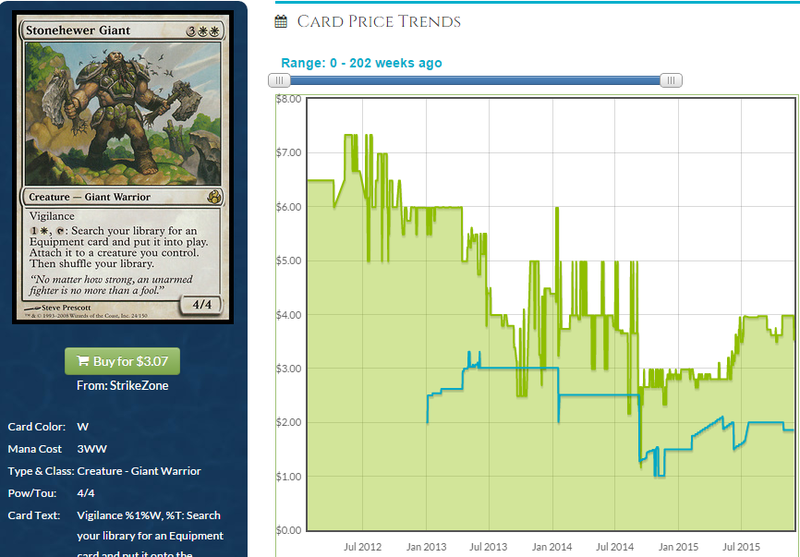 There are a lot of reprints in the “top cards” for this deck. And why not? Since it’s a brand new commander, a lot of people who build the deck are going to use a lot of cards that came packaged in the same precon Mizzix came in, and a few of those cards are very good in the deck and that’s why they were such obvious reprints in the deck. Still, there might be a card or two worth watching. This has demonstrated the ability to hit $10 more than once in the past. It’s a two- to four-of in Legacy, and it is very good in a deck where the cards in your graveyard will have their mana cost reduced. I like this at its current price, and with retail plateauing and buylist price creeping up, movement may come sooner than later. All Is Dust isn’t getting cheaper. 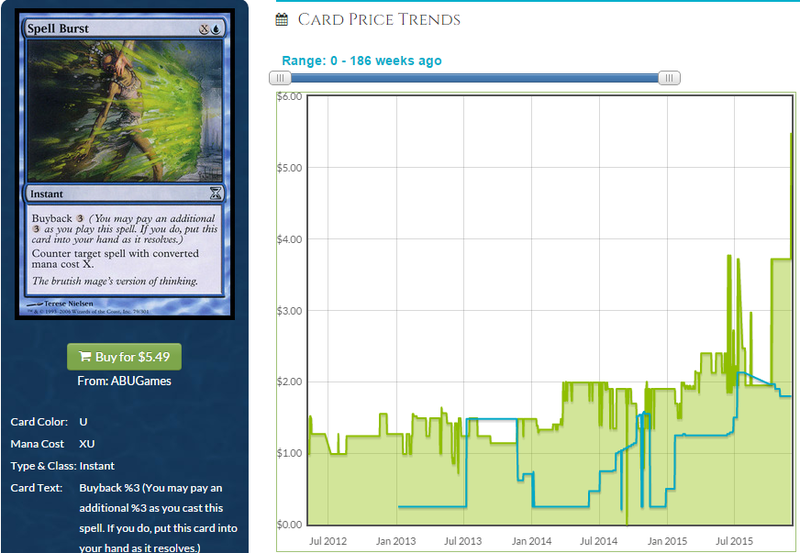 I expect it to rebound from the reprinting it got in Modern Masters 2015 this summer, and that this is the cheapest it will ever be. In two years, when this is $12, everyone is going to look at this graph and say, “Wow, when was it ever that cheap?” and not be at all surprised it went back up. Modern Tron isn’t going away and this being a zero-mana wrath in Mizzix. It’s a good target. It’s not Reiterate good, but it’s solid and at its floor. 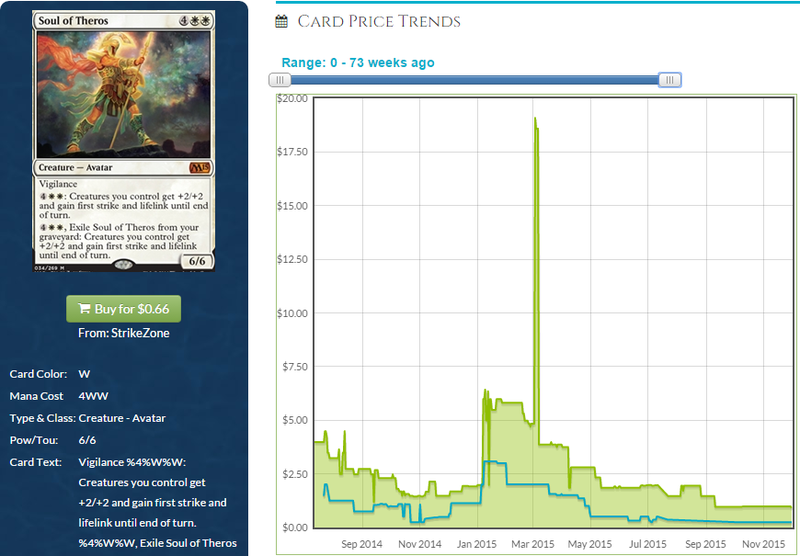 I think it will take more than EDH to push Spell Burst up from a quarter to a price you will be glad you bought in, but the foils look juicy, even at $5. Spell Burst is dumb in Mizzix, also. Let’s go looking at other Commanders. We should be able to find some gems when we look at what people are playing with Ezuri. 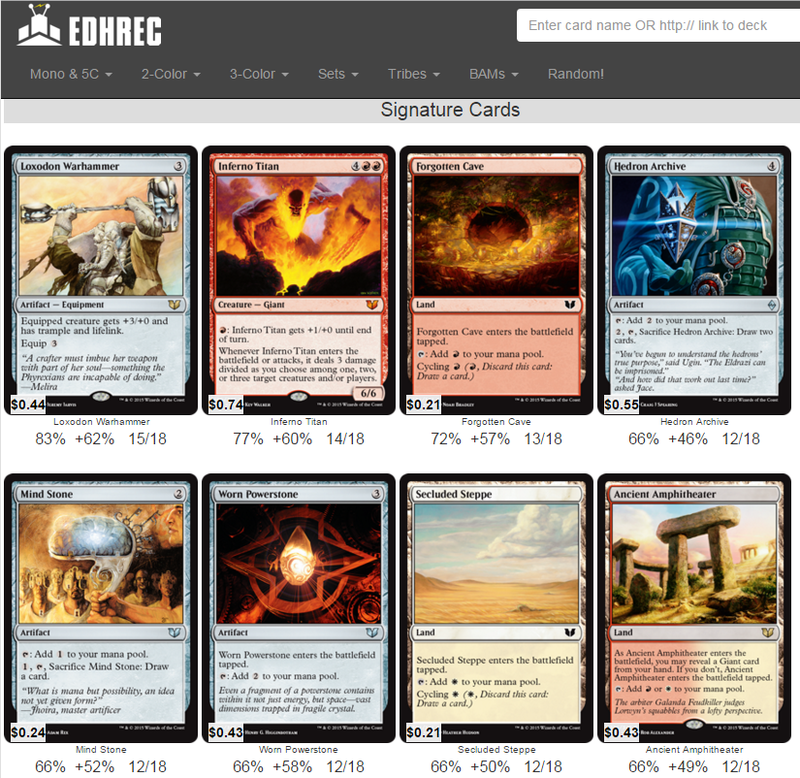 I took all of these cards from the EDHREC page for Ezuri unless I state otherwise. This is a no-brainer. With enough experience counters, Ezuri can dump enough counters on this that you can set up and infinite turn loop. Foils of this haven’t even moved. I realize this isn’t as old and rare as Reiterate, but it’s also dumb and cheap and stupid, and if someone else starts buying aggressively, how obvious this is with Ezuri should start an avalanche. At under $2, it should be easy to trade for every copy of this in your LGS and buy a few to fill your spec box. This may get a few cents cheaper, and I would wait to see what happens as more copies of the Golgari deck are opened, but this card and Ezuri go together like peas and carrots (or like exaggerated caricatures of the mildly mentally handicapped and Academy Awards). They put it in the wrong deck but you can always go back and put it in the right one. 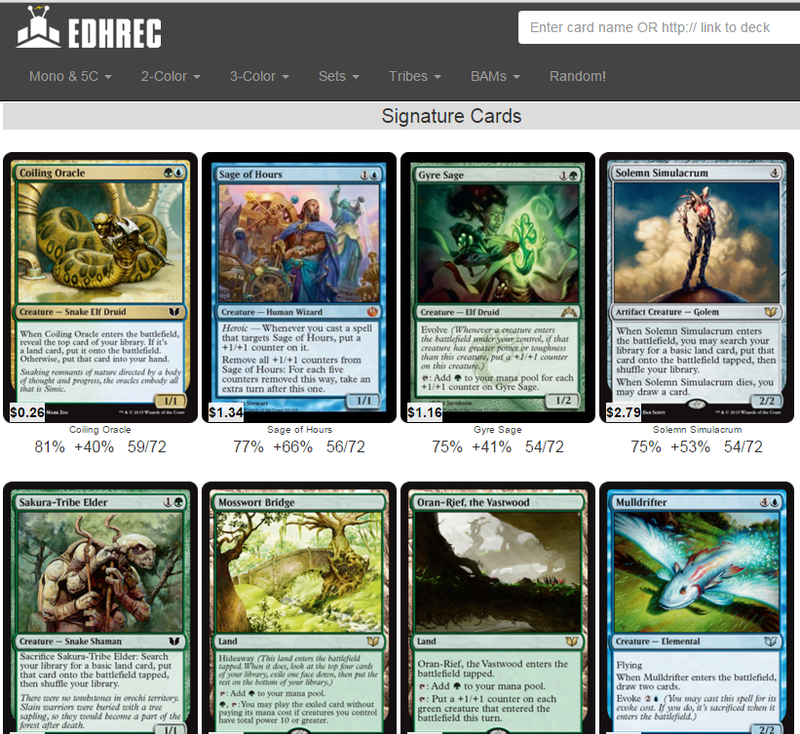 Mycoloth is always going to be nuts in EDH, but it’s especially nuts in Ezuri decks. Left unchecked, you will just make a trillion saprolings a turn, and it’s hard to lose at that point. 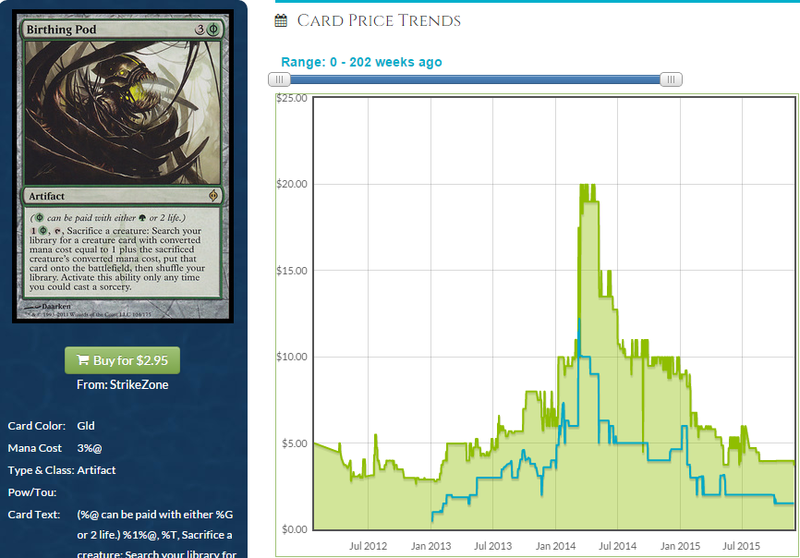 Being from a recent set doesn’t help much, but being from an under-bought core set offsets that to an extent. I think this is one of the best decks for Skulker and I always thought this was just dumb in EDH. Lots of UG decks played Lorescale Coatl already, and this is just better. Wait, he triggers Ezuri and gives him experience counters when he dies or gets bolstered when Ezuri is handing out counters? Sign me up. 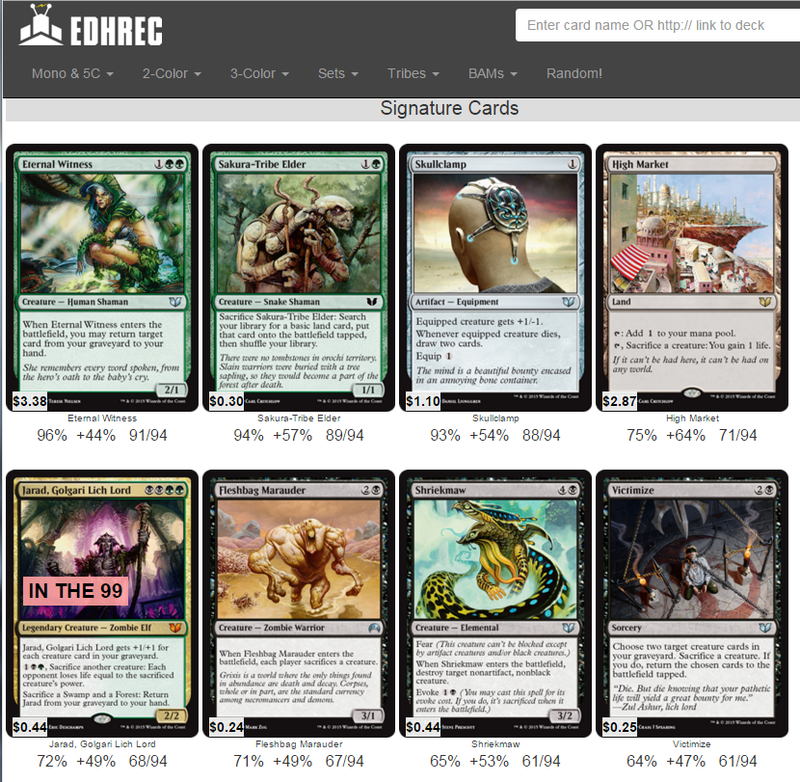 This deck is pretty boring and a lot of the cards that are appearing in a majority of the decks and therefore triggering a high correlation rating in EDHREC are in the precon. Still, I think there are a few gems. This isn’t going to get cheaper and it’s actually stupid good in Kalemne. You are playing bigger creatures than average, so giving them a boost plus lifelink and first strike is going to make combat fairly miserable. Even if your opponent is chump blocking, you’re going to gain so much life they will struggle to kill you unless they just play Magister Sphinx like a dirty piece of trash. Sure, the reprinting hurt this guy, but he is on the rebound and it’s a good time to buy. Blade of Selves is a card we are very interested in tutoring up, and this guy does just that. He can also get Sunforger and other equipment which is handy. This is a good card and EDH decks will always want him. 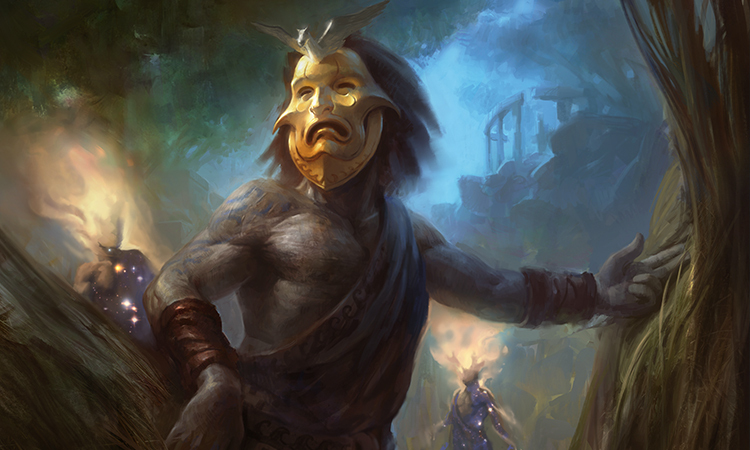 This deck is all about value, bringing creatures back from the dead over and over. Let’s see if it’s about the other kind of value, also. Is this card a good buy around $1? 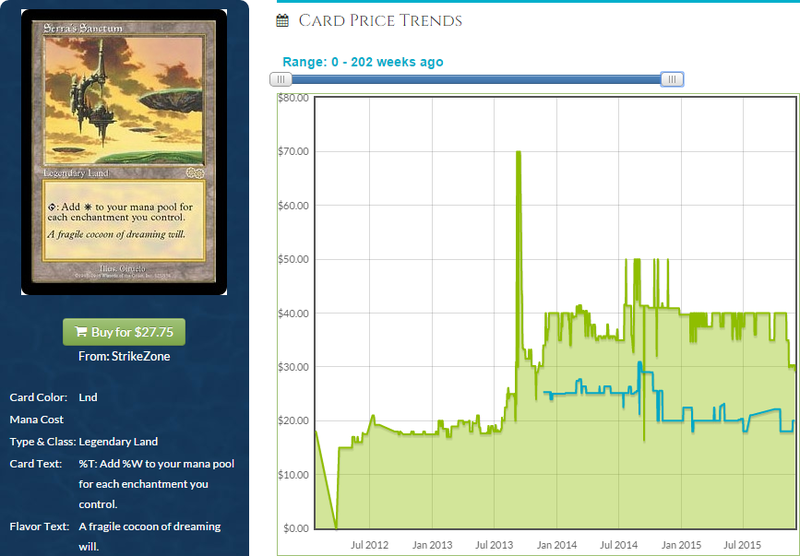 Awakening Zone has shrugged of multiple reprintings to still be the price it is today, and with From Beyond being situationally a much better card, I can’t imagine we won’t see a similar price trajectory. I plan to jam about 100 copies in my spec box, mostly from trading, and see what happens in two years. Not as many reprints as Awakening Zone got, that’s for sure. If loving this card is wrong, I don’t want to be right. Can you believe it hit 50 cents? I couldn’t either, so I bought lots of them. I traded for a lot more. I used dealer trade-in bonuses to turn other cheap rares into copies of this card. If this never hits at least $4, I will be really surprised. I realize it’s a recent non-mythic, but come on, read the card. It’s more expensive than Grave Pact but also easier to cast, especially in a three-color deck like Prossh. This card is nutty in Meren and Mazirek as well as other decks it was already good in. This will probably not be unbanned in Modern for a while, if ever, but it’s still A+ tutelage in EDH and still has some Legacy relevance, to the extent that Legacy is relevant. Is this done falling? I hope not. I want lots and lots of these the closer if it gets to a dollar. Gimme! This is going to be fun, but it’s also going to take a minute for any cards here to spike because these will all have very high correlation values for Daxos, as a lot of these cards aren’t super useful elsewhere. It will be up to Daxos to be popular and push these cards up, but I think it can do it. 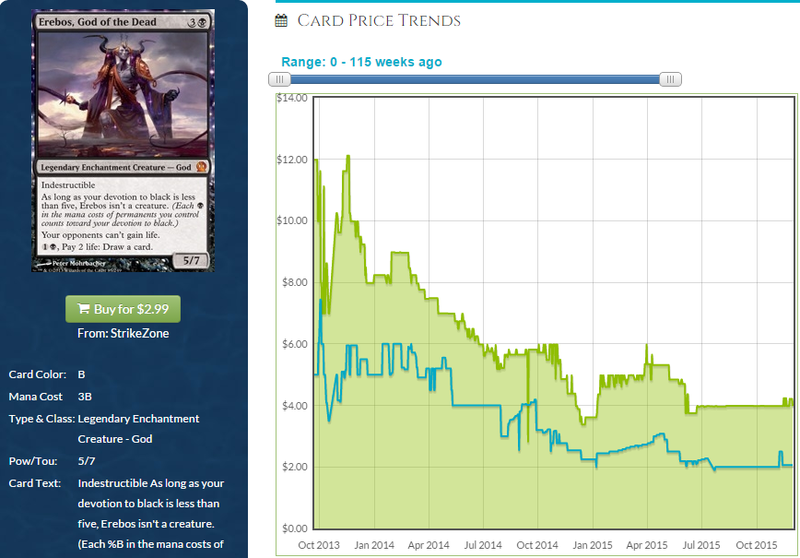 If Daxos takes off, this is a $50 card or EDH has zero influence on prices. There is no in-between. 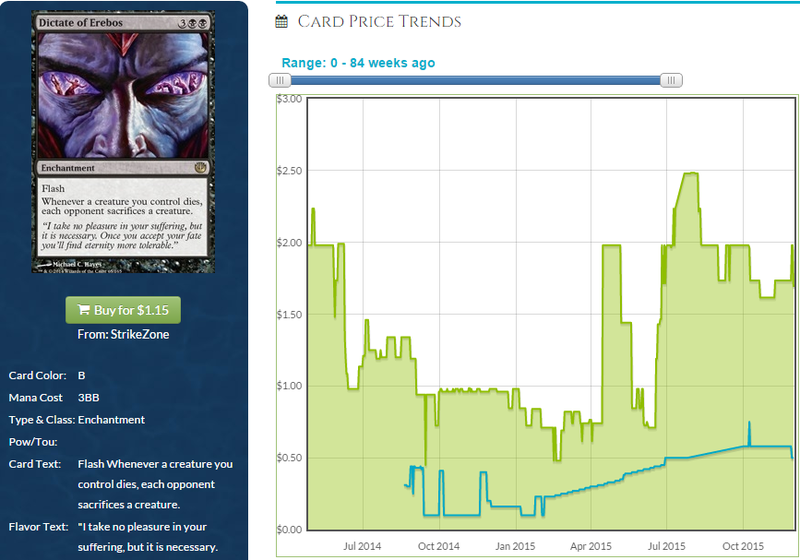 This card just needs a nudge and its non-zero relevance in Legacy can help justify the new price to people. There are very few copies of this online, and if you can get these with a trade-in bonus rather than taking cash when you buylist to a site that has a few copies, do it. 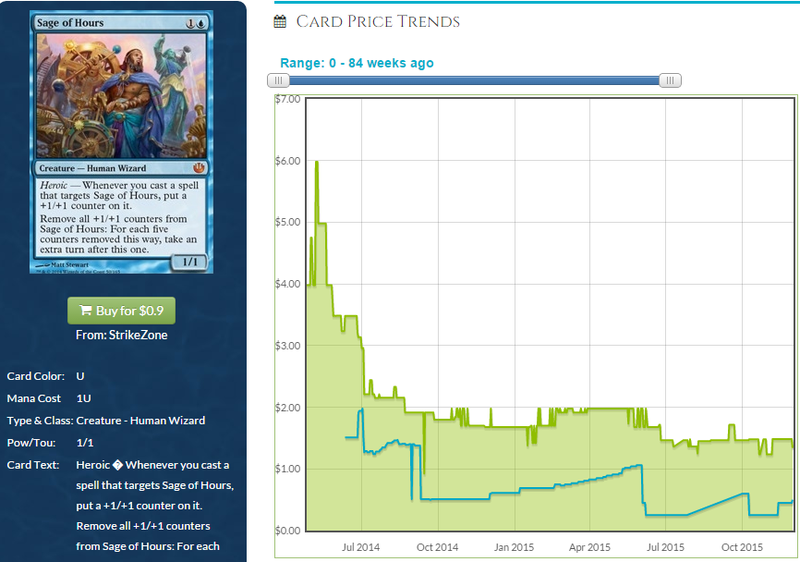 I expected a little bit of a dip at rotation, but as this card’s price was never really predicated on Standard, it shrugged off that chance to dip in price. This is stupid with Daxos and with Sanctum, and I talk about that a lot but that’s because it’s true. This is a $5 card in a $3 card’s body and it will figure that out. The real question is how long will it be $5? I don’t know how high this can get, and it certainly can’t ever be as much as Purphoros or Xenagos, two ridiculous EDH commanders that are at home in a lot of 99s. This card is tied to one commander in general, Daxos, and that’s a lot to ask of a single commander. Still, this card is likely to go up because of how dumb it is with a good commander, so if you can trade for these with a Standard player who forgot to dump them at rotation or something, snag them. This is way more playable than Heliod, replacing Greed, replacing “players can’t gain life” effects, and being a strong commander as well as 99-inclusion. 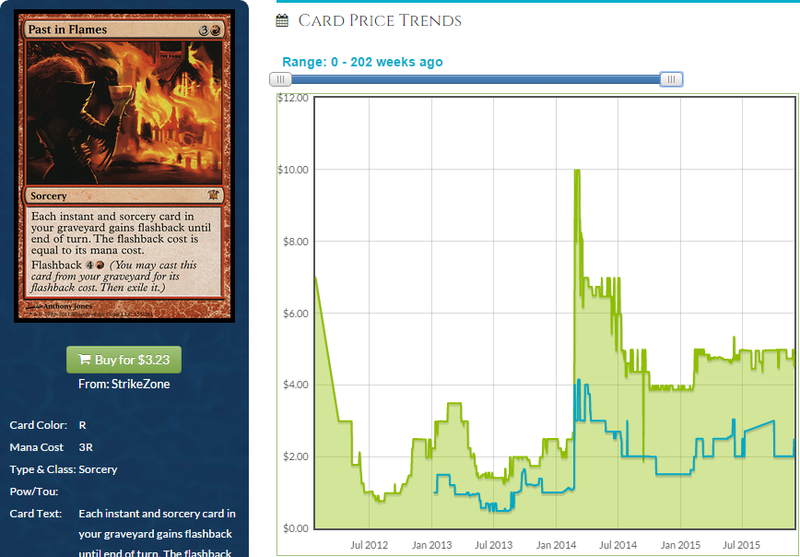 The stark difference in playability is not reflected in a stark difference in price. 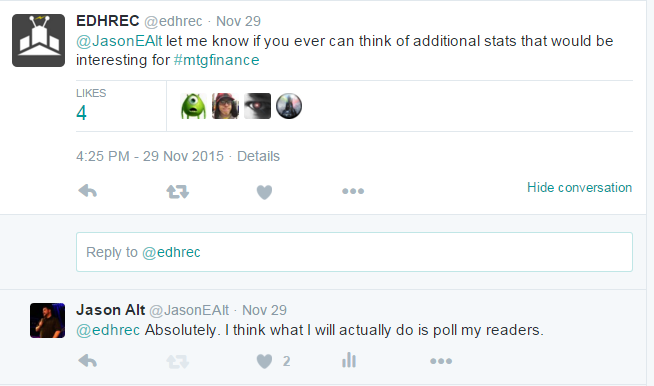 I really feel EDHREC can work both ways for us. 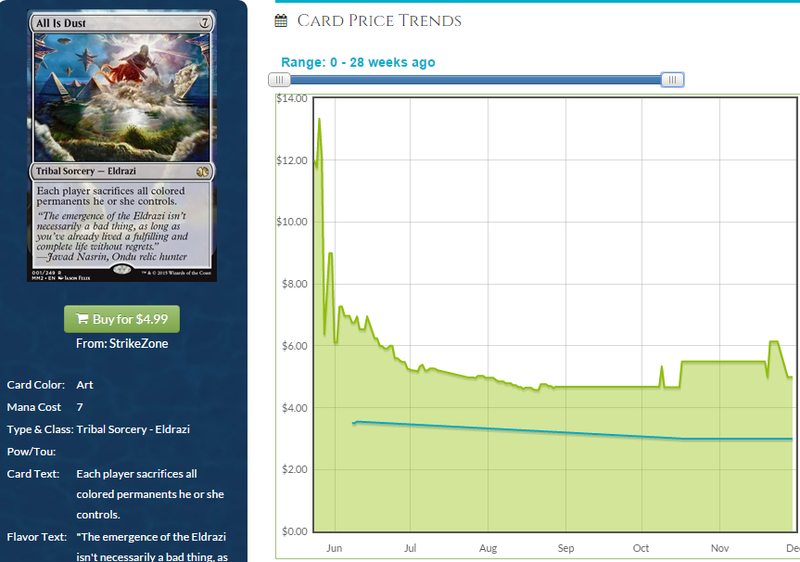 Not only can we use it as a tool to say, “Well, it’s no wonder this card spiked,” after a card goes up in price seemingly irrespective of playability in the formats that people who think they know a lot about Magic pay attention to, I think we can predict things, or at least see which card’s prices are tied to a specific general and which are format staples. While we’re at it, this happened. Can you think of any additional stats that would be helpful to you? 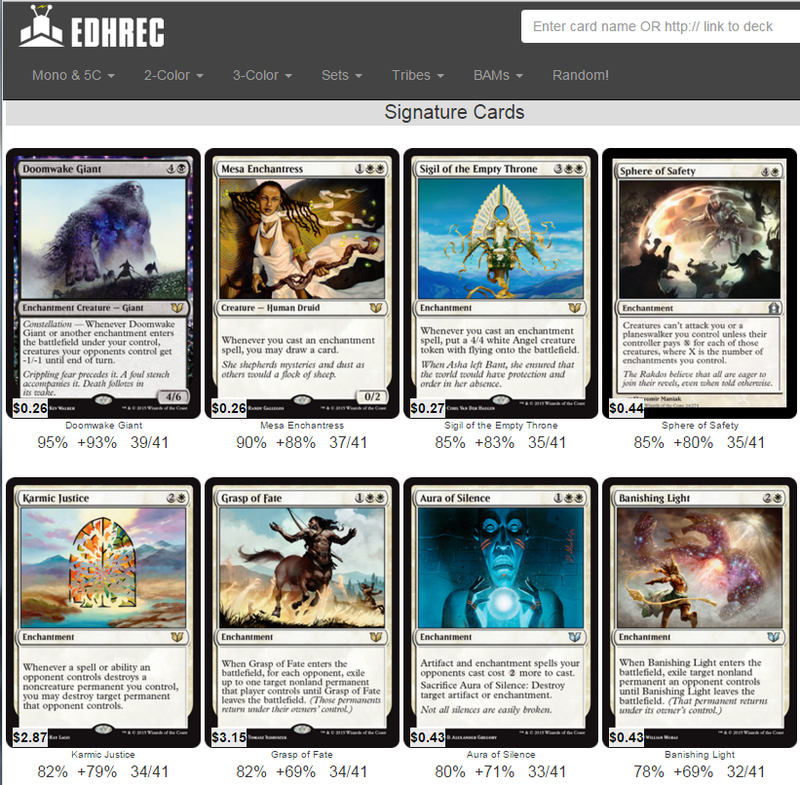 Dream something up and leave it in the comment section for me to pass along, or you can message EDHREC directly. They’re willing to develop metrics that finance people will find useful, and we’d be insane not to take them up on it. I have a few ideas of my own, but I want to see what you come up with, The site is very useful as-is, but I bet we can come up with something great. I just checked as well, insane!! Yep, really glad I got my set the day after Ezuri was spoiled for $4 each. 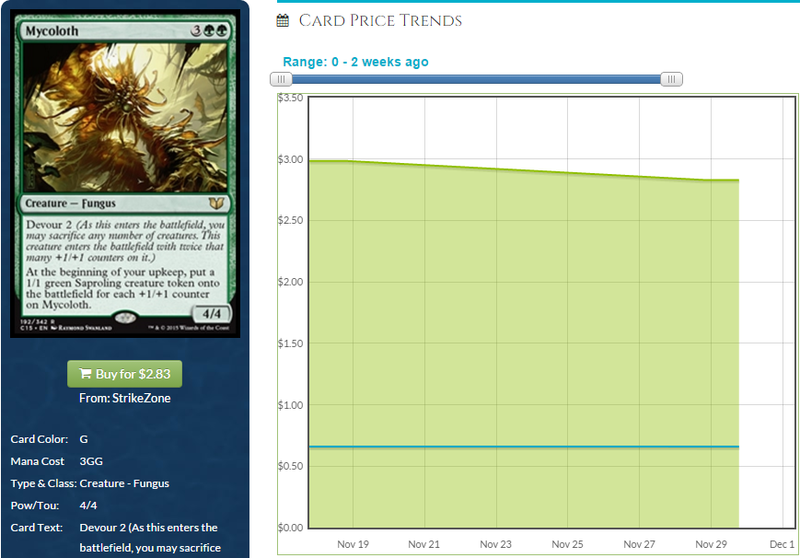 Jason’s twitter has saved me $25 on my Ezuri deck already. I feel like the non-foil has upside, but the foil sure is responding to the Ezuri pairing nicely. Watch the trajectory on foil Contagion Engine – I bet it comes down a bit. Reiterate is already slightly less than $40 a play set on ebay though I don’t know how many people want play sets. It’s been in my collection for years and I kept asking friends “why isn’t Fork good any more?” Actually, isn’t there a functional reprint of Fork in M13 or something?? What card is that, might be worth looking at (if I’m not making it up)? 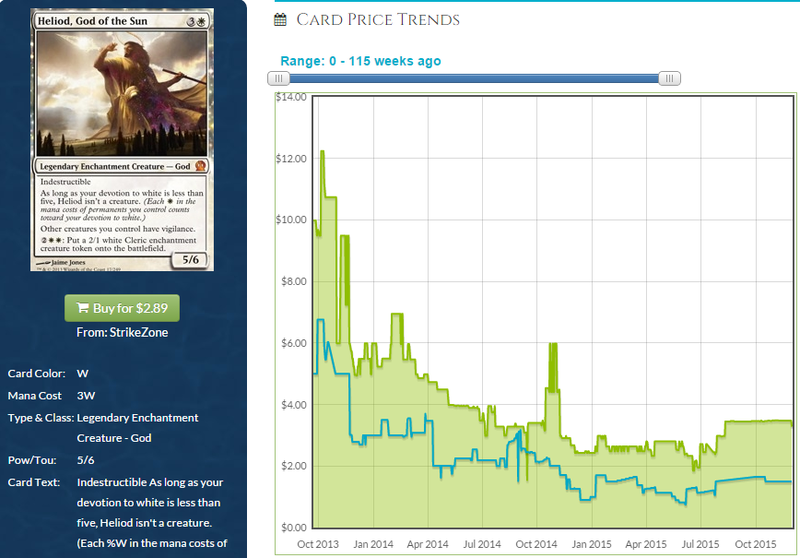 Your sidebar about someone casting Magister Sphinx was hilarious. We all know that person, super funny to hear you go off. Birthing Pod is never getting unbanned in Modern. It was banned because every new value creature made the deck better, so either Wizards stops making good creatures or bans Pod before it gets completely out of control (they chose the latter). Never say never. 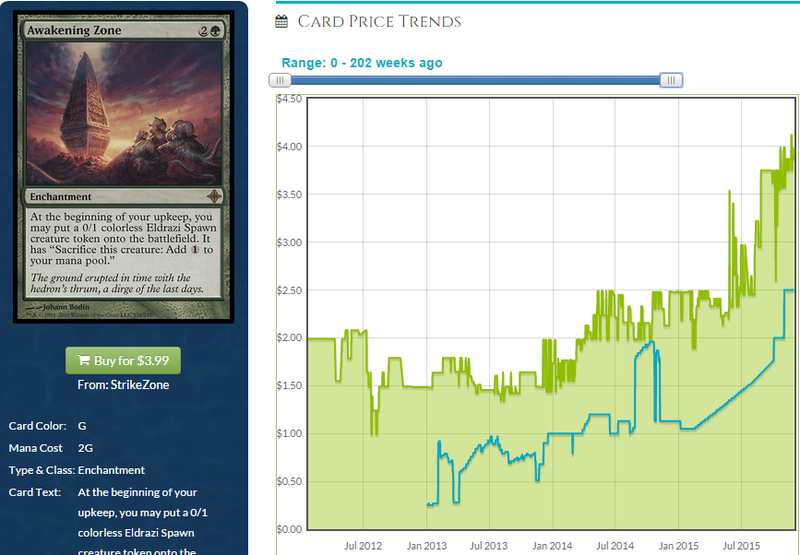 Modern could look very different in a few years, or they could add a new format that doesn’t ban it. You never know. 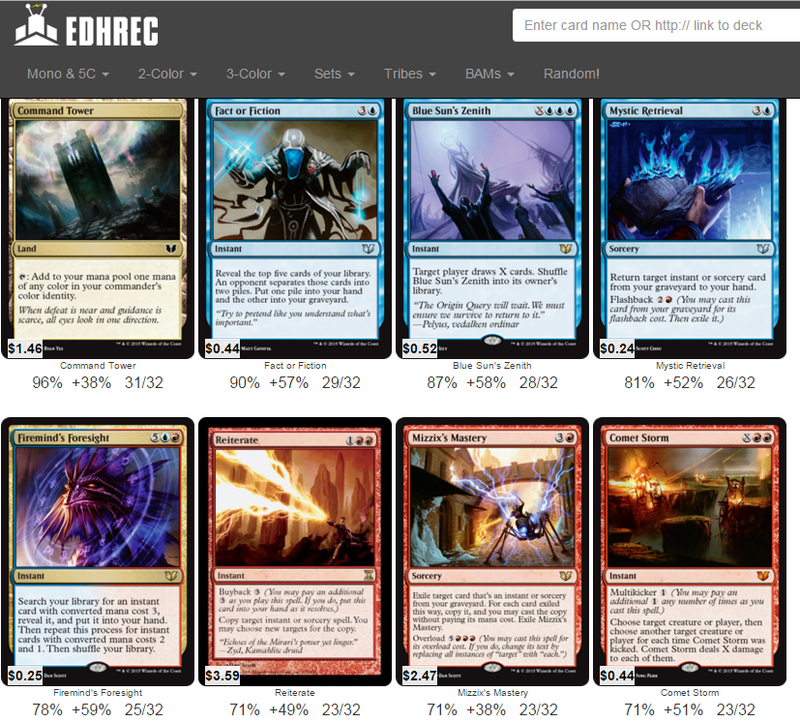 I love EDHREC. Got introduced to it a few months back and it’s really helped my decks, and shown me a few gems i’d never considered. I wish I could help on the finance metrics but alas I’ve drawn a blank. Great article too Jason, I just keep coming back for more! 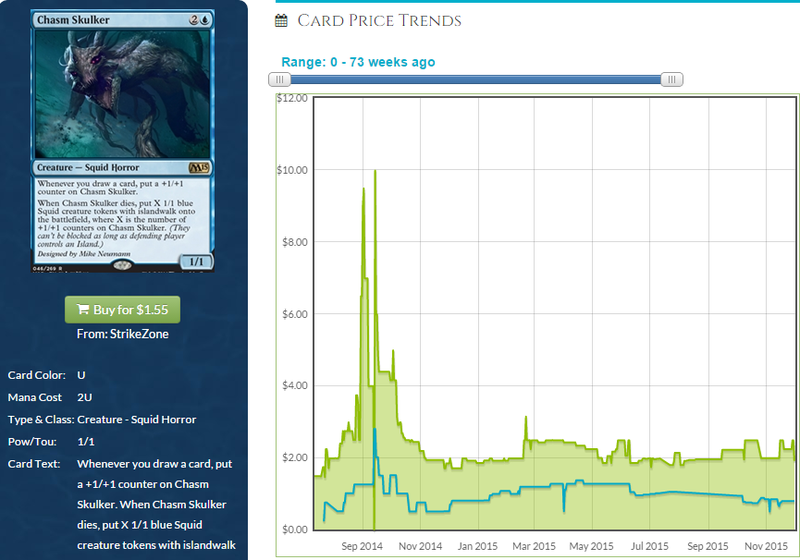 I would like to see a function on EDHRec that would allow us to identify cards that are surging in popularity. Perhaps something that would spotlight cards that make a large percentage jump in decks for a commander. Or maybe if there’s an seldom used (or new) card that suddenly is used in a large number of decks. Maybe they could have a different color on the percentages listed under the card? That would be easy to program and wouldn’t require a separate page, although maybe a list on a sidebar of surging cards would be a nice at-a-glance function. Wow, a Luther Ingram reference. Well done. I have a notch more respect for you at this very moment. Literally my impetus for writing the article. 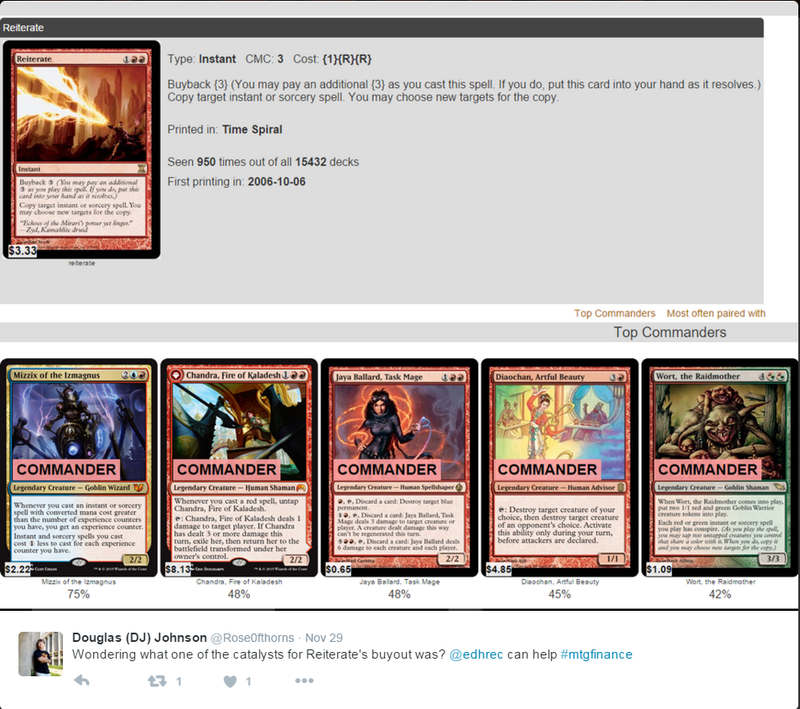 How about user created polls related to commanders? I’d also really like to have a weekly podcast discussing EDH as a whole; decks, interactions, finance, etc. I feel like Command Zone and Commanderin’ both do a very good job covering EDH. If you want more finance, maybe they will have me on as a guest, again!